Before his final homestand began, Vin Scully was honored for his legendary career by the Dodgers. Elsewhere, the Rangers completed back-to-back division titles, while the Mets had yet another rotation shuffle. With the Dodgers in their final homestand of the season, broadcaster Vin Scully is in the final stretch of a remarkable 67-year career that dates back to 1950, when the franchise was still in Brooklyn. On Friday evening at Chavez Ravine, the Dodgers kicked off a weekend of festivities devoted to the retiring Hall of Fame broadcaster with “Vin Scully Appreciation Day.” The first 50,000 fans at Dodger Stadium received a special letter from Scully, and prior to the game against the Rockies, fellow Dodgers broadcaster Charley Steiner emceed an hour-long ceremony that included a video tribute narrated by Bob Costas, and speeches by several luminaries. In his letter, Scully related the story of how on October 2, 1936, as an eight year old, he caught a glimpse of the line score of that day’s World Series game—an 18–4 rout of the Giants by the Yankees—while passing a Chinese laundry. He took pity on the downfallen, and became “a rabid Giants’ fan” until the Dodgers hired him 14 years later. Scully noted the symmetry of the fact that 80 years to the day, he will make the final call of his career when the Dodgers close out their season against the Giants at AT&T Park (Scully will call all three games of that series). Said Koufax, who rarely speaks in public, “As many times as I’ve been on this field, I don’t think I’ve ever been this nervous.” He expressed his gratitude for Scully never being a homer and recalled, “Before the World Series, Vin would go to church and pray, not for a win, but so that there would be only heroes, not goats." Following the ceremony, Scully left the field on a blue carpet lined by Dodgers. The festivities delayed the start of the game by 35 minutes, but afterwards, the Dodgers defeated the Rockies 5–2. With the Giants’ loss to the Padres, Los Angeles’s magic number to clinch the NL West is now 2. Oakland’s Kendall Graveman retired the first 18 batters he faced on Friday night, but once the Rangers found their way to first base, they rallied for three runs, allowing them to put the wraps on their second straight AL West title under manager Jeff Banister. They’re the second team to clinch a division title this year; the Cubs, who clinched the NL Central on September 16, were the first. Graveman needed just 59 pitches to throw six perfect innings, but once Carlos Gomez beat out a chopper that made A’s shortstop Marcus Semien range deep into the “5.5 hole,” the floodgates opened. Gomez took third on Ian Desmond’s single, then scored the game’s first run on Carlos Beltran’s groundout. Adrian Beltre followed with a homer, his 31st of the season and the 444th of his career. With a 91–63 record, the Rangers have a half-game lead over the Indians (90–63) and a full game lead over the Red Sox (90–64) for the league’s best record and a Division Series date with the AL wild-card game winner. 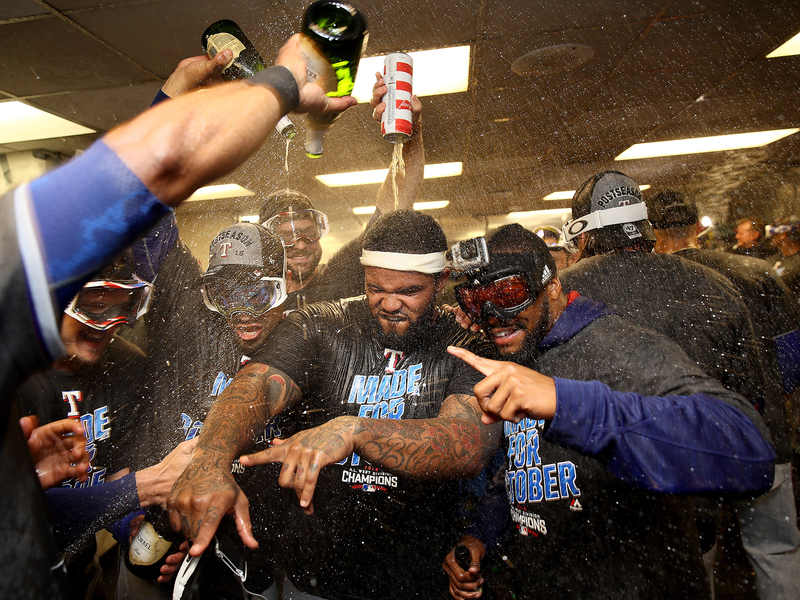 They took first place in the AL West for good on May 29, and have held it ever since. Remarkably, they won the West while outscoring the opposition by just 12 runs (734 to 722), as they’ve gone 36–11 in one-run games, for a what would be a record .766 winning percentage if it holds up over the season’s final eight games. Already facing the reality that Matt Harvey, Jacob deGrom and Steven Matz—three-quarters of the postseason rotation that carried them to the pennant last fall—are all done for the season, the Mets announced on Friday that they have another outage: Noah Syndergaard, by far their best starter in terms of ERA (2.63), FIP (2.33) and strikeout rate (10.6 per nine) was scratched from Saturday's start against the Phillies due to strep throat. Lefty Sean Gilmartin, whose lone big league start from among his 63 major league appearances was a 70-pitch, five-inning effort agains the Phillies last Oct. 1, will go instead. While strep throat is certainly preferable to an arm injury, as it should clear up in a few days, the scratch puts the Mets in the position of scrapping what had been a fairly well laid-out plan. Syndergaard would have had five days of rest before pitching next on Friday, Sept. 30, also against the Phillies, the 159th game of the season, and then four days rest before pitching in the NL Wild Card game on Wednesday, Oct. 5. Given that the team entered the day in a three-way dogfight for one of the two NL wild-card spots—tied with the Giants, half a game up on the Cardinals (who then lost on Friday afternoon), they probably can't afford to skip their ace entirely. Which wild-card hopefuls have easiest, hardest schedules in final stretch? Manager Terry Collins told reporters he was hopeful of using Syndergaard on Monday or Tuesday against the Marlins. That would put Syndergaard in position to start Game 162 next Sunday—if it were critical to the team's claiming a playoff spot on four or five days of rest—with 43-year-old staff savior/cult hero Bartolo Colon, who is currently scheduled to pitch that game, in line to pitch the wild-card game. Should they get through the wild-card game, or need to play a Game 163 (in the event of a two-way tie) or even 164 (in the event of a three-way tie), the Mets will of course need other starters, and Tom Seaver ain’t walkin’ through that door. They'll likely turn to rookie righties Seth Lugo (2.61 ERA, 4.12 FIP in 58 2/3 IP) and Robert Gsellman (3.13 ERA, 3.07 FIP in 31 2/3 IP), who have both far exceeded expectations while filling in for Matz and deGrom, to round out postseason front four.